Our Nanny Pat’s Adventures ebook is now out! Based on our popular Nanny Pat’s days out in Cornwall blogs, the ebook is full of ideas for things to do and places to go with pre-schoolers in Cornwall. Many of the suggestions will take you off the beaten track, and are either things you can do for free or for very little money. When I became a grandmother (shock horror, reaching for the hair dye and peering in the mirror reading the road map of my busy life) I volunteered to take care of my grandchildren one day a week. Firstly, there is all that stuff that comes with them. Had I forgotten the clobber from when I had my two boys some decades ago? No, I just think we managed with far less – car seats for instance, we never had them. My two survived and even spent long journeys in the rear section of our old Opel estate playing with their toys! I now have to juggle with three or four seats at a time and they all have different knobs, levers and catches designed to keep my motor skills sharp. Also, my children have decided to carry their children around in slings of various types, again designed to require problem solving akin to making the colours line up in a Rubik’s cube and requiring me to do gym workouts at least twice a week to be able to carry them around for long. Then there are their kit bags. We can’t go out without changes of clothes, nappies, snacks, drinks, sun cream, soothers and so on. I have had to get back in the groove of the delights of nappy changing and spoon feeding, being on demand and responsible for the most precious creatures in my world and if I stop to think about it for long, it’s very scary! Despite all of the above, we’ve had a ball. My principal aim has been to share precious moments with them and have fun outdoors. Occasionally we have had to dive indoors in the face of torrential rain but mostly have been out and about suitably attired for any kind of weather. We have splashed in puddles, crunched through autumn leaves, dug innumerable sandcastles, examined rock pool creatures (being gentle and careful with them and returning them safely to their homes of course) wandered around magical gardens, walked for miles, eaten tons of ice cream, visited child focussed attractions – and all of us have loved every minute. I can honestly say I know my way around most of Cornwall’s public toilets and baby changing facilities, am word perfect on most of their favourite songs and nursery rhymes, have exhausted almost every I Spy word inside and outside the car, and apart from fuel, food and drink and a few tickets (National Trust membership is invaluable here for car parks and restaurants) I have spent hardly any money on our days out. The days out became blogs which guests have enjoyed reading at home and trying out for themselves whilst down here on holiday. When I realised I had actually written some 45 adventures I decided to put some of our favourites into this ebook so they were more useable and easily found. We also have printed a copy of the book and put one in each cottage for guests to borrow and enjoy. Nanny Pat’s Adventures is available free online as an ebook. If you enjoy it, please share the love and pass it on to family and friends, or via social media. 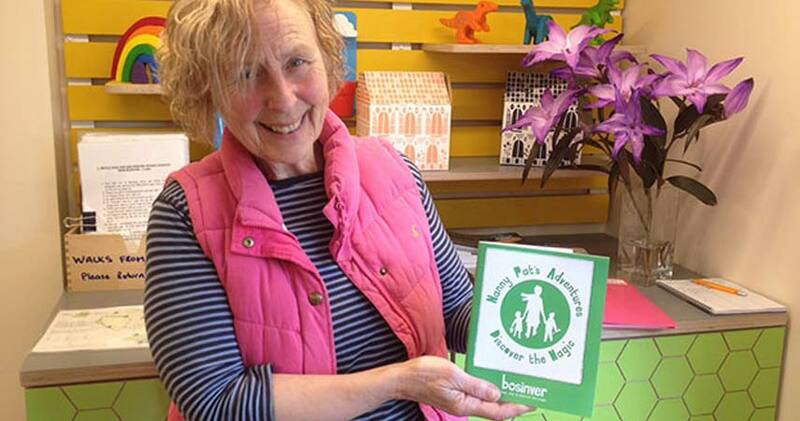 Don’t forget you can also download our 50 things to do without a car from Bosinver ebook for more ideas for great family days out. If you try any of our child friendly days out (or have any suggestions for where Nanny Pat should visit next in Cornwall), please let us know! Leave a comment below, email us, post on our Facebook page or tweet @Bosinver – we’d love to hear from you.